If you are unsure about what types of games can be tested with PlaytestCloud, then you are in the right place. Here you will find all the information about which types of games can be tested through PlaytestCloud, what the restrictions are, as well as answers to the most commonly asked questions. What types of games can I test with PlaytestCloud? Please contact us if you're not sure where your game fits in the above lists. If your game is for a mobile device or web browser, we’ll find a way to test it. *This is due to Apple’s copy protection, please contact us for options if your game is already in the App Store. Do I need to make modifications to my game? Short answer: No. In the majority of cases, you won’t need to make modifications to your game to test it with PlaytestCloud. PlaytestCloud automatically hooks into your game to capture the entire player experience, including audio & video recordings of the gameplay. Before your playtest begins, PlaytestCloud automatically runs a compatibility check. If there are issues with your game in our testing environment, we can usually address them with minor tweaks to our software. If we determine issues are not with our software, we will reach out to you to help resolve the issue – which could lead to a delay in turnaround time. However, in most cases, we can address minor compatibility issues in our software without the need for additional turnaround time or communication. What type of build do I need to provide? You can create such a build using Xcode, or you can import it from a number of supported build distribution services (see below). 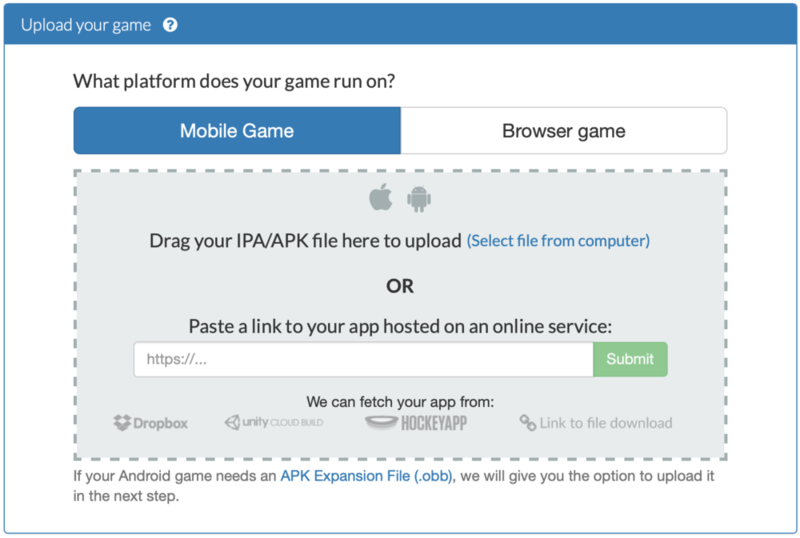 Android: On Android, we need your game in the form of an APK file. If your game supports both the ARM and x86 architecture it’s important that you provide us with a build that has support for ARM devices – normally this is the default. Android builds can also be imported from supported build distribution services. For more info on which services we support, see “Which build distribution services does PlaytestCloud support?” below. How do players install the game? Players install the game from our website to their personal mobile device. We make that possible on iOS through re-signing your game using an Enterprise certificate. On Android we also re-sign your build. That means you don't need to upload a special build or add our players to your Apple account. We make sure it works. Which build distribution services does PlaytestCloud support? Downloading builds directly from Dropbox is also supported, and we are open to adding support to our order forms for your internal build management system so you and your team can conveniently place orders. Just contact us! Apple’s TestFlight service is not supported as builds distributed using it are protected by Apple’s proprietary DRM protection which prevents us from adding our screen recording functionality. The builds distributed via PlaytestCloud are secured using safety measures designed especially for mobile user research. How does PlaytestCloud keep builds secure? During the upload and download process, your game builds are protected and secured through an encrypted connection to our servers (HTTPS) and stored safely on Amazon’s Cloud Platform. When distributing your game build to players for the playtest, we use both technical and non-technical measures to keep your games safe. One of these measures is a kill switch that permanently disables your game after the playtest. In addition to the kill switch, non-disclosure agreements are mandatory for all our players. Please visit our confidentiality & security page for the full details about how we keep builds secure.